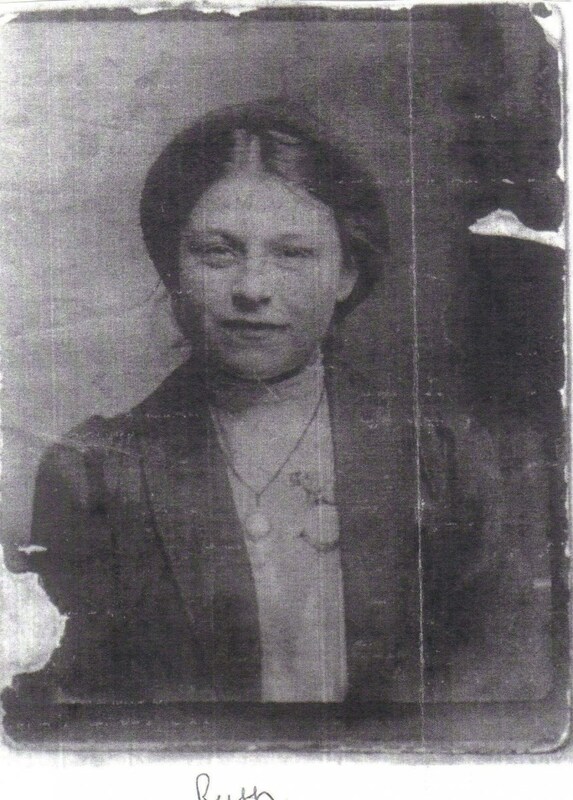 Im trying to trace my nans sister who went missing at 16yrs in 1912. She was born Ruth Farrand in 1895 in sheffield to Frank Farrand and Ada Farrand nee Ellison. At the time she went missing, she was in service and resident as a general servant to william Clarkson and his family whom he was a registrar of birth and deaths on 42 carr road, sheff. (1911 census) They was a piece in the newspaper of her missing and her father recieved a letter postmarked london from a woman stranger stating Ruth was safe and well. He her father also went to london to search for her but to no success. She was never to be seen again. 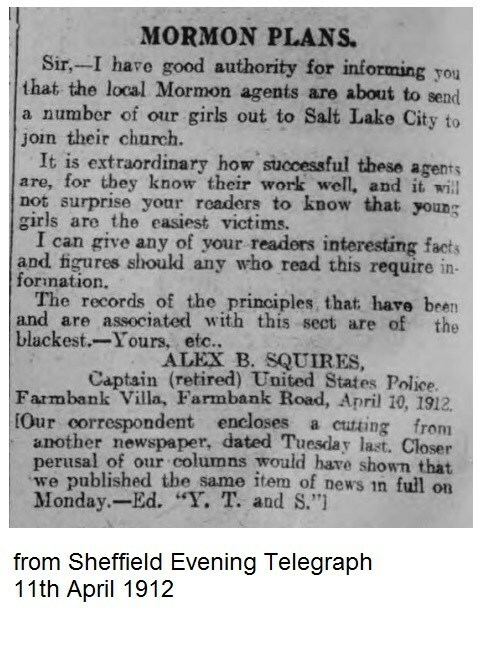 They was talks of white slave trades and mormons in sheffield at that time and the family thought she may have been took away by either one. I know its a long shot, but if anyone can find out any info of Ruth or the slave market etc..or either william clarkson because he was very much a suspect in my family eyes. Maybe he got her pregnant and sent her away? Thank you if anyone can help i just wish the 1921 census hurries up to come out. William Clarkson died in September 1920, and on 29th September his widow was appointed to his old job, the Registrar of Births and Deaths for the Ecclesall North Sub-District. He was buried on 30th September at St Mary's, Walkley. Do you know when in 1912 she disappeared? Was the report or notice in a local newspaper - I looked but couldn't find it? The Clarkson household would have been in mourning in September when an 11 month-old daughter died in the Children's Hospital. If Ruth was still there she may have reacted to the grief in the household. Do you know Ruth's exact date of birth? I don't know if it will help but some later records (death records, 1939 register) record dates of birth. The Clarksons' address was 47 rather than 42 Carr Road - in 1911 William used a ink stamp to put his address on the census form (one he probably used in his work). The '7' is curvy but it is definitely a 7. I live a few doors further up Carr Rd. I also know a granddaughter of William. Thanks for your help Edmund. Ruth was born in april 1895 she was still 16 when she went missing in 1912 so it has to be before april, her next birthday. Her parents lived at 43 longfield road at the time she went missing. What i cannot understand is the family was really poor, living in a 1 up and 1 down house with 9 kids at that time, in total they had 18 children 4 of them died really young. Looking at ruths photo she has a nurses watch and a necklace, which made me think they was no way her parents could afford these items, thats another mystery. I do know, as soon as ruths brothers turned 15 they was kicked out to fend for themselves. Ruth would have to give her wages to her parents. Which made me think she did a runner? But giving that she lived with the Clarksons so she had her own room instead of sharing with all her siblings and more luxuries than her family home, so why she would leave this? I dont know. Prob will never know, but its been a thorn in our family in finding something that can put a light to her disappearance. Can die trying at least. 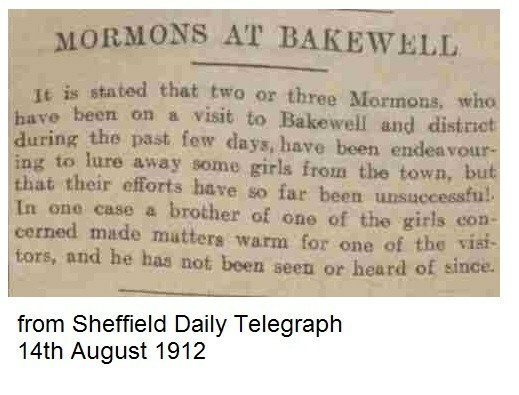 The newspaper which reported her missing was the sheffield telegraph. Thanks hugh as well. The death of clarksons daughter that died may have effected her? But she had been through the similar of seeing some of her siblings die too while growing up in her family household. I dont know, ive gone through so many possibilities, with her so young maybe shes got herself into trouble and made a runner. Her father wasnt the best of the guys to get along with. FARRAND, Ruth (of 6 Gilpin Lane, born ~). Baptised April 15, 1896, by Jno Darbyshire at St Philips Church, Shalesmoor. Parents name(s) are Ada & Frank (Labourer). Yes Lyn, thats her. Hey Chris, thats very interesting. I know her dad Frank wasnt a easy person to get on with. So it wouldnt put it past me that she was secreted away from him due to pregnancy. Thanks all for your help.